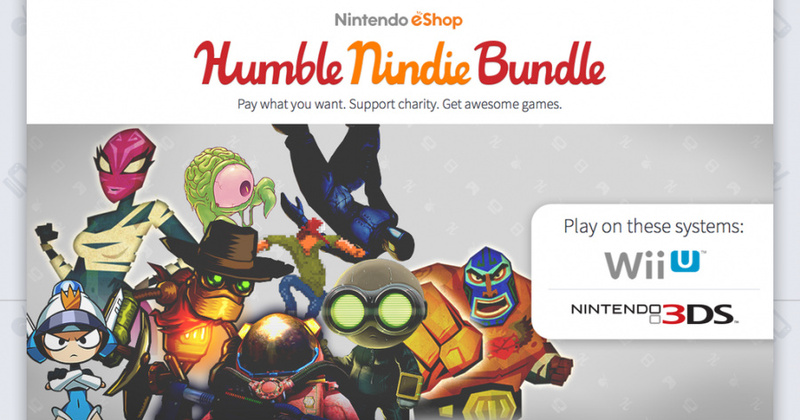 A rather surprising promotion went live this week - the Humble Nindie Bundle. It's only available in the Americas, though Nintendo of America's Damon Baker has stated that there were efforts to make it global and there's scope for future promotions. The frenzy of attention is naturally on the pay-what-you-want angle, which allows 3DS and Wii U owners to grab some truly excellent games at a hefty discount. Yet Humble Bundle's not just a fire-sale of games, it's much more than that. This feature will be split into two sections - a basic FAQ to fill you in on what Humble Bundle is, and our thoughts on the relevance and potential implications of this move by Nintendo of America and some key 'Nindies'. What the Heck is Humble Bundle? Humble Bundle was started in 2010, originally as a new approach to promote indie PC games while also raising money for worthy causes. It proved a major success and has become a multi-million dollar business in its own right, with weekly bundles covering games on PC, Mac, Linux and smart devices, in addition to some bundles with music and eBooks. Oh, and now the Nintendo eShop. Each bundle of games is only available for a short period, and you can pay whatever you want ($1 or more) for those games. Typically there are a few core games, then others locked behind a (still inexpensive) minimum price, and then even more games are available if you pay over the 'average' amount from those bundles bought so far. New games or extras are often added as a bundle's campaign progresses, too, and this can include soundtracks and other downloadable goodies. Meanwhile, when making your purchase and setting how much you want to pay, you also determine how that payment is split - you divide the money between the developers / publishers, Humble Bundle and then the relevant bundle's chosen charity. Games / Music / eBooks are distributed in various ways, in some cases DRM (digital rights management) free, though that's obviously not the case with the eShop. DRM-free downloads are distributed through Humble's own website and download portal, but in examples such as the eShop purchases will be provided in the form of redeemable codes. Why is This Humble Nindie Bundle Only in the Americas? This is a logistical issue, it seems, with both Humble Bundle and Nintendo of America's Damon Baker admitting that it's a consequence of the challenges faced with this promotion; these are DRM-free downloads, remember. It's the first time that consoles have featured on Humble Bundle, and evidently supporting multiple regions just couldn't be done this time. Hopefully this will be resolved in the future. What Else Does Humble Bundle Do? As it's evolved as a business, Humble Bundle has also launched its own store for selling PC games, which runs entirely separate promotions. While unlikely to threaten the behemoth of Steam, it's another string in its bow. In addition Humble Bundle supports developers with general code distribution - those that funded Shovel Knight on Kickstarter may remember receiving their download codes through a Humble Bundle service, for example. 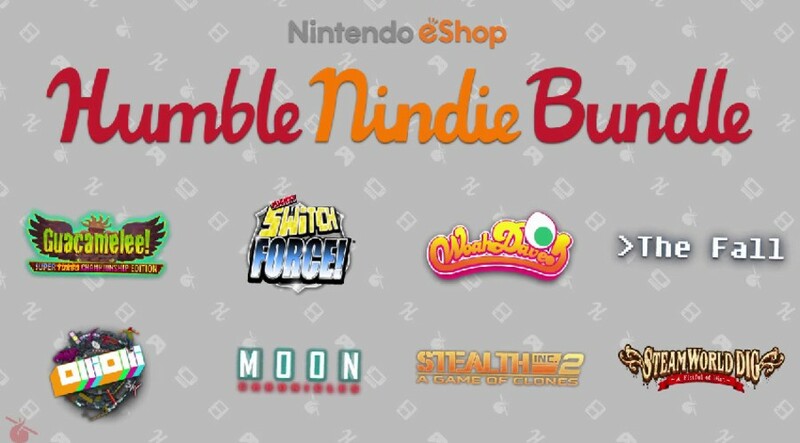 Anyway, Whatever, Where Can I Get the Humble Nindie Bundle? If you're in the Americas you can check it out right here - it'll run for another 12 days at the time of writing. We won't deny that we were surprised at the announcement of the Humble Nindie Bundle this week, even if it was tinged with disappointment at it being limited to the Americas. It's been obvious for a long time that Nintendo of America and Nintendo of Europe operate separately, each with their own Nintendo Direct broadcasts, release schedules and marketing campaigns, and it's unfortunate that this promotion couldn't be aligned across both regions. One issue is that one of the offered games - Moon Chronicles - isn't yet out in Europe, along with a range of logistical challenges with code distribution and so on; all of that said, it's a pity. We shouldn't lose sight of some key landmarks, however. This is the first time that console stores have featured on Humble Bundle, and is arguably the most notable evolution of the service since it first hosted major triple A publishers. It's not often that the eShop is the first to commit to such a high-profile move, so regardless of individual views on its merits we must admire the chutzpah that Nintendo of America has shown. We can also be sure that Nintendo of America won't have committed to a free-to-play model such as this without a full endorsement from Nintendo's Kyoto HQ, and in that respect this shows a further willingness of the company to embrace new distribution ideas. Yet still, this bundle allows eShop gamers to save a lot of money and pick up eight games (and 10 downloads with cross-platform) for just $10, a huge saving and another big move away from the conventional approach to retain 'value' in download gaming. Humble Bundle is a different beast from a standard race-to-the-bottom, to be fair. For one thing every bundle can raise a serious amount of money for charity, which is to be commended. Any developer taking part in a bundle is doing so willingly, too, so their eyes will be open. Humble Bundle is often used, ultimately, to promote and spread awareness of established games that have been around for a fair amount of time, tempting gamers to experiment and try titles they'd otherwise skip. Developers get their games to more players after peak sales have dried up, charities benefit and there are warm sentiments all around. It's perhaps a little trickier with the eShop, and we do have some minor concerns about the impact of promotions like this. One issue is that some of these games are relatively recent, albeit not all, and have arrived in the past six months or so. The tricky question is whether Nintendo does more of these in future, and if so how regular they'll occur - the eShop stores have plenty of games, but far less than the Wild West of the PC scene, so there's a danger that regular Nindie bundles will do more to encourage gamers to steer clear of full price downloads, even more so than they already do. There are no simple solutions, but we've recently written extensively about the dangers of the pricing dilemma on the eShop. Those are concerns, and it'll be hard to gauge - until we learn more - how this unique bundle influences eShop spending in North America, if at all. It may serve the intended purpose that many developers have when utilising Humble Bundle - extract a final flurry of sales on a title that's lost all other download momentum. Beyond those doubts, we can't help but be impressed by this partnership, and the positive PR it can bring for Nintendo. Humble Bundle is a notable 'brand', particularly in PC and smart device gaming circles, and Nintendo's just placed an eShop flag in that territory. In terms of bringing new eyes to what the eShop can offer, and also creating significant buzz among existing Wii U and 3DS owners, it seems like a winning formula. Stay tuned for in-depth Humble Nindie Bundle coverage on Nintendo Life, including an interview with Nintendo of America's Damon Baker later today. I haven't ever bought a humble bundle, but I think I will purchase this one either today or tomorrow even though I already own half the games. It's sort of weird that this much attention and praise is going towards Nintendo for this happening. It's a good step forward I know, but for any PC gamer a Humble Bundle is just a weekly occurrence. They're great deals - it just funny that for consoles (especially Nintendo ones) this is the best sale that's pretty much ever been seen for games. I should point out that this bundle gives you FOUR copies of OlliOlli since the game is cross-buy. I'm disappointed this isn't coming to Europe, as I'd be interested in this. I don't have many eShop games yet and this would be a nice way to get some. I understand the concerns with "race to the bottom" pricing, but why not mention that games may be overpriced for the current generation of gamers. Let's face it, 10$ off physical titles/15$ off digital would go a long way in moving product... Not saying that devs don't deserve their money, but if they are not going to see much money due to pricing policies, that's not our fault as gamers. I just hope this means good things for the future "Club Nintendo", whatever it will be called. And yes by good things I do mean primarily sales, but also bundles, and branching out and advertising. @Platypus101 - What's your point? @Geonjaha read. That's the point. Too bad it's not available in Europe. I'd have bought in a blink. Nothing here really interests me, but it is certainly a nice idea. What would be really surprising and bold would be if nintendo released humble bundles for their actual IPs too. Humble VC Bundle would generate so much money for charities and bring a lot of attention to both nintendo and the humblebundle guys. Some good games here. Guacamelee! in itself is worth donating a dollar or more for. Also next week a few more games will be unlocked for this bundle increasing its appeal! Be interesting to see which ones pop up! It's thanks to Humble Bundle that I found games like Sanctum, Cities in Motion 2, and Orcs Must Die, (amoung others). I'm waiting to see if Shovel Knight gets added for at least 3DS. If so, I'm definitely getting this one. I thought this exactly. Maybe a Humble Mario Bundle to celebrate 30 years? It is a mighty fine deal for those who don't own those games yet. Hope to see more bundles. I love the idea. Can't wait to see what games are going to be added! Im on the Have most of the games already side. But this is awesome. @IceClimbers I'm pretty sure it's two. I plopped down $10 for the 5 Wii U games (since I do not own a 3DS). Gave them all a quick run, and all but Olli Olli grabbed me. Guacamelee and SW Dig appear to be the modern version of 8-bit platforms that I enjoy and are terrific stylistically. The Fall looks very intriguing as well. Had a very Metroid space isolation feel. @manwithoutfear well you can always give away the codes you have to somewhat who might want it. Is anyone in NA doing the B1G1 for Don't Starve? I'd love to trade a code for Guacamelee!, OlliOlli, or SteamWorld Dig. I was thinking of trading the ones I already have for a code for Don't Starve. Where is the UK one is all I want to know. I paid $10 and got all the games. OlliOlli is ridiculously addictive, and Guacamelee is great. Bold step? Come on. They sold other people's games (i.e. indies), low-priced at that, and then region locked the whole thing so it wouldn't get out of hand. EA put a few blockbusters and a bunch of classics up when they did their first HB. That's a bold step. This is just more leeching off the indies from Nintendo. @Vann Thank you Vann!!! I'll enter this in ASAP. You rock! @Vann Well, I have been strongly considering checking out Mighty Switch Force. If it's not already committed, of course. @Vann How much did you end up donating, anyway? I would positively kill for Nintendo to do eShop exclusive games and Virtual Console first party titles this way. I'd buy a heck of a lot more Virtual Console games if they did some bundles like this here and there. I'm hoping this is enough of a success to convince Nintendo to take some chances like that. @SethNintendo can I have it please? Or is already taked? Does anyone know if the download codes expire? I'm tempted to donate $10 for the Wii U titles (I already have all the 3DS titles on offer), though I don't have a Wii U yet and probably won't get one for at least another few months. This is a really good deal. I'm glad NoA and the indies involved could make this happen. It's also pretty neat that Nintendo is first out of the 'big 3' to have Humble Bundle on their platforms. I'm definitely eager for more HB in the future. @Platypus101 - It can be stated hundreds of times, it doesn't make it less true. I also don't go through previous comment sections to make sure what I'm saying hasn't been brought up previously. @IceClimbers yep I knew this, if I get the bundle I may give the olliolli code for 3ds to a friend. No they aren't. Not even close. You get an eshop code that can be used once on one machine. You can then never move it off that one machine (except a transfer which erases it and everything else off the source machine. That's the very defintion of DRM. Normal humble bundles are DRM free because you can download a .exe and then copy it ad nauseum if you want to a million pc's. @SethNintendo i get it, thanks so much, what do you think of the game anyway, because I heard is very short, is that true? Because we love throwing salt around, here is a rumor for the next four games coming to the bundle (if you already beat the average, you get these games).